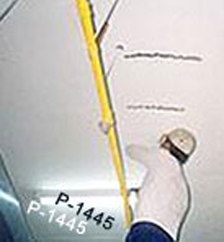 The E-1445 is an epoxy resin based on an improved polyamide. Its low viscosity extends open time and lowers the generation of heat. It is in widespread use in civil engineering applications for reinforcing cracks. It does not shrink upon hardening, providing outstanding adhesion and durability. When the main agent and hardener have been mixed together they must be used within 120 minutes. Before this product completely hardens, tools can be cleaned with solvents.